Last TV Show Watched - Crossroads (featuring Ronnie Milsap and Los Lonely Boys). I'm not into country music so I'm not sure how or why I wound up watching the entire show. Last TV Show I Enjoyed Watching - American Chopper (NAPA Bike episode #2) I can’t get enough of that show. Great chopper designs, quirky family members. I've probably seen every episode at least 3 times. (I'm not embarassed to admit it either. I'd love to shoot/edit an ongoing documentary (reality show) like that). 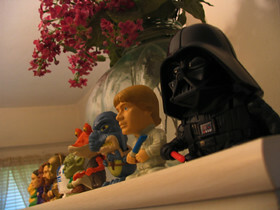 Last Absurd Purchase - A full set of 31 Star Wars III toys from Burger King. My coworkers and I converged on our local Burger King and got the goods for 99 cents each. Now I don’t know what to do with them. (The Selling price on ebay is currently hovering around $90. My coworker just sold his extra sets for around that much). For now I think they'll grace my armoir until I have guests. Then they'll be quickly hidden. (I'm not one to let my "nerd flag" fly too high). Last Thing I Left Home Without - My still camera. Every time I do I miss at least one photo opportunity. Last Take Out Meal - Jaspare’s 9” Pepperoni Pizza. (I literally ate one of those a day, five days a week for nearly 8 months back in 1995/96). Last T-Shirt Acquired - black short sleeve Orange County Chopper shirt. I never wear it because I look like a poser. I think I need some tattoos before I can wear it in public. Last Run In with the Law - Talked with a cop about the meth lab problems in the area while our cars were being repaired at the mechanic’s shop. Last Place I’d Want to Live - Coober Pedy in Australia. A mining community where the inhabitants live underground. Last Physical Fight - 4th grade. I got beat up in the morning by a kid, ironically named Buddy. I then beat him up in the afternoon. We got along fine thereafter. Last Magazine Read - Transworld Skateboarding Magazine. Although I’m not immersed in that culture anymore the magazine still has cool photos and great ad layouts. Last Thing That Made Me Laugh - My mom’s admission she can’t stand to be in a room when the Little Giant Ladder TV commercial is on. Last Thing That Made Me Go Huh? See answer above. My Mom admits to not knowing why that commercial bothers her. It is strange because she isn’t prone to stupid phobias like I am. Last Thought - I remember in my high school yearbook that a large majority of my peers wrote "Sam, don't ever change." That makes me think what would happen if I didn’t change anything about me since 1989? I’d still have a mullet, drive an ‘81 Chevette with a luggage rack, listen to cassette tapes and work at the grocery store. I'm thinking my peers were a little short sighted.